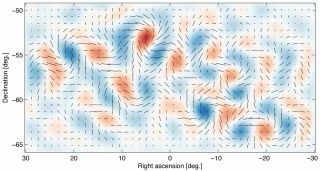 Gravitational waves from inflation create a twisting pattern in the polarization of the cosmic microwave background, called a "curl" or B-mode pattern. The actual B-mode pattern observed with the BICEP2 telescope appears here. A celebrated and controversial astrophysics discovery is about to receive even more scrutiny. In March, a team of astronomers announced that they had spotted the signature of primordial gravitational waves in the cosmic microwave background (CMB), the ancient light left over from the Big Bang. If it holds up, the discovery would confirm the theory of cosmic inflation, which posits that the universe expanded at many times the speed of light in the first few instants after its birth 13.8 billion years ago. But some scientists have voiced skepticism about the result, saying that the discovery team may simply have seen patterns created by dust in our own Milky Way galaxy. The conversation about the potentially epic find will now likely reach a new level, because a study detailing the new discovery was published online Thursday (June 19) in the journal Physical Review Letters. Indeed, the study's authors — led by John Kovac of the Harvard-Smithsonian Center for Astrophysics — acknowledge the "extensive discussion" in a note they added to the study after submitting it. The note addresses some new information about Milky Way dust. While the discovery team stands behind their find, asserting that primordial gravitational waves are the best explanation for the observed CMB patterns, they say they cannot conclusively rule out the possibility of foreground dust contamination. "More data are clearly required to resolve the situation," they write in the note. Follow Mike Wall on Twitter @michaeldwall and Google+. Follow us @Spacedotcom, Facebook or Google+.